Up until 1940 the donkey was an animal which was soon in the Norman countryside. They were very important to the farms and were used for many daily tasks. The donkey has the advantage of being a robust animal and easy to use, and they require little care. Its cost is really less than the horse and we can be found in all farms and was often called: "the horse of the poor". The donkey is smaller than the horse and was adapted to be packed. 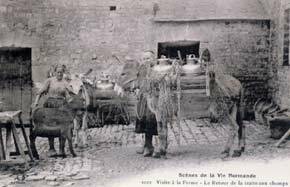 It was mainly used to transport the milk in des copper cans at the beginning of the twentieth century and later in milk-churns as represented on the two postcards above. 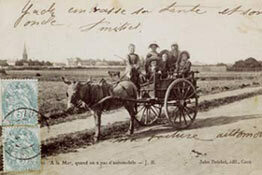 But the donkey was also used with a cart by a few small-farms. 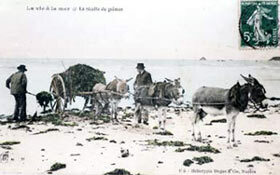 For example the first postcard shows three donkeys harnessed "à la volée" on a tipcart to transport at low tide the kelp rejected by the sea. These algae were used like manure for the market gardener or the pastures. But with the fast development of agricultural mechanization after the war, the donkey has lost its work on place the farms and its population decreased in the decades following. The department of the Manche which counted approximately 9000 donkeys at the beginning of the century, saw its numbers reduce considerably up until 1970. But since this time the donkey started to become more popular. It is not used lowever any more in Normandy for agricultural work but simply like a pet. Moreover, a new tendency has started over the past by the green tourism using again the donkey to carry loads but this time for pleasure. 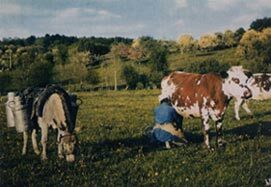 Thus, every year, many ramblers who walk in France use donkeys to carry their backpack and all necessary equipment to the camp-sites. One can quote for example Jacques Clouteau a famous writer who has written about the excursions which he has done with his donkey Ferdinand, among which is the journey to Saint-Jaques de Compostelle (cf. amazon.fr). 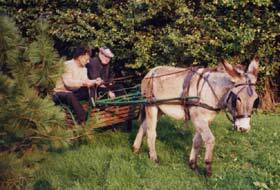 Many donkey owners are passionate about leisure carting with barouches or marathon cart. 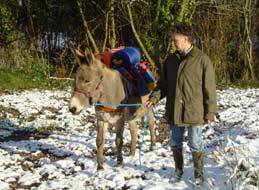 To prove this passion for donkey, the department of the Manche account now approximately 2500 donkeys all races.